Red Room Exhibition of Selected Photowalkers' Works in Centered on Taipei, November 2018 – Look Through The Lens? Will you? 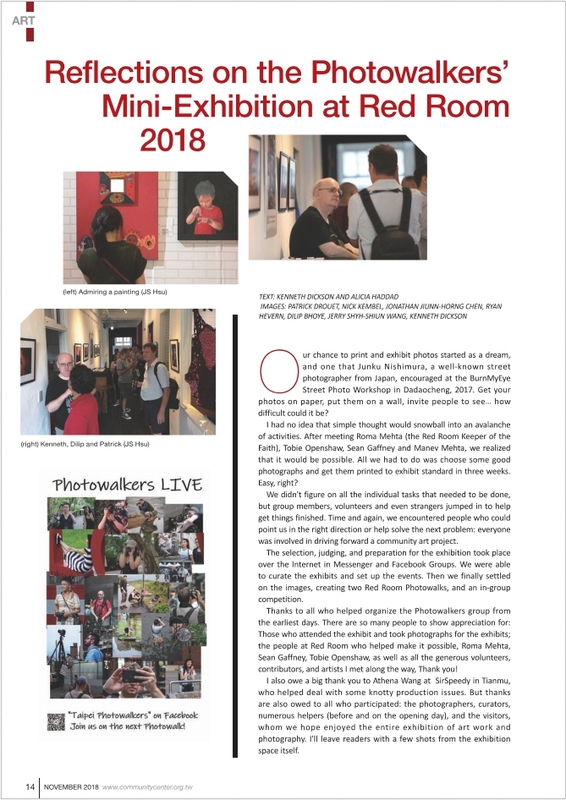 “Reflections on the Photowalkers’ Mini-Exhibition at Red Room 2018” published in Centered on Taipei, November 2018. Text and pictures by Kenneth Dickson & Alicia Haddad. Exhibits by Individual Photowalkers: Patrick Drouet, Nick Kembel, Jonathan Jiunn-Horng Chen, Ryan Hevern, Dilip Bhoye, Jerry Shyh-Shiun Wang, Kenneth Dickson. Pg 14~17.